According to Mariemont athletic director Tom Nerl, Tickets are $100 and $150. The dinner begins at 7 p.m. and Rose will speak around 8 p.m. The social will begin at 6 p.m.
Watch the following video where Pete Rose talks with Keith Oberman about the progress on his MLB reinstatement, PED users in the majors, and this year’s World Series. Rose played from 1963 to 1986, and managed from 1984 to 1989. In August 1989, three years after he retired as a player, Rose agreed to permanent ineligibility from baseball amidst accusations that he gambled on baseball games while playing for and managing the Reds, including claims that he bet on his own team. In 1991, the Baseball Hall of Fame formally voted to ban those on the “permanently ineligible” list from induction, after previously excluding such players by informal agreement among voters. In 2004, after years of public denial, Rose admitted to betting on baseball and on, but not against, the Reds. The issue of Rose’s possible re-instatement and election to the Hall of Fame remains controversial. Playing Field Promotions is a booking agent for motivational sports speakers and celebrities. 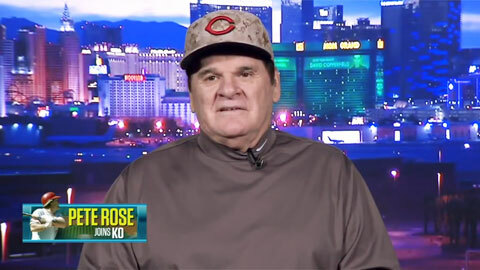 If you would like to book athletes like Pete Rose for a speaking engagement, autograph signing, guest appearance, product endorsement, charity fundraiser or corporate event, contact our booking agents for appearance and speaker fees or call 1.800.966.1380.